Abcam Mouse Cytokine Antibody Array - Membrane (ab169820) detects 97 Mouse Cytokines. Suitable for all liquid sample types. Cytokine arrays are an antibody-pair-based assay, analogous to ELISA, but using a membrane as a substrate rather than a plate. 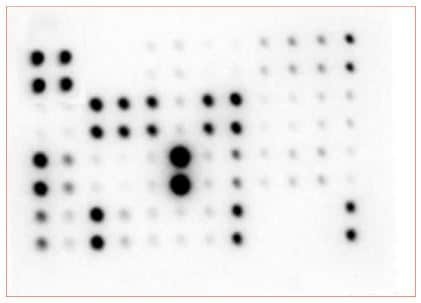 Capture antibodies are supplied arrayed/spotted on a membrane with each pair of spots representing a different analyte. Sample is added (0.2-1ml of 1 sample to each membrane), and then paired biotinylated detector antibodies and streptavidin HRP. The cytokine array is analyzed using the same methods as a chemiluminescent western blot. Comparison between samples can be by eye or using densitometry software for a semi-quantitative comparison. If you are interested in this cytokine array, a table listing all of our mouse membrane antibody cytokine arrays and other arrays and the analytes they measure is available here. Our Abpromise guarantee covers the use of ab169820 in the following tested applications. Multiplex Protein Detection Use at an assay dependent concentration. Typical results obtained with Abcam Membrane Antibody Arrays. The membrane was probed with conditioned media from two different cell lines. Membranes were exposed to film at RT for 1 min. Publishing research using ab169820? Please let us know so that we can cite the reference in this datasheet. There are currently no Questions for ab169820.